I ate a lot of cold sandwiches as a kid. Cold peanut butter and jelly. Cold peanut butter and honey. For a brief, wonderful period, cold peanut butter and pickles. Then came cold turkey, cold ham, cold roast beef. When I got to college, I discovered something called a “panini,” and it changed my world. They weren’t even very good paninis, but they were toasted and warm instead of cold and flimsy. It was then that I discovered the superiority of the toasted sandwich, and I vowed to never go back. I now toast every sandwich. There isn’t a single sandwich I would prefer cold. 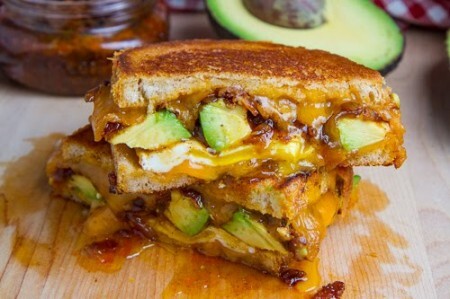 Lunch meats, peanut butter and jelly, bacon and avocado…everything. I’m convinced the toasted sandwich is far superior to cold in every way. I know this is simple pet please that may not resonate with everyone, but I wanted to mention it because I don’t want to take for granted the fact that toasted sandwiches are an option. It wasn’t always this way. So today I toast to you, toasted sandwiches. Thank you for warming my soul and my belly. This entry was posted on Monday, January 20th, 2014 at 12:16 am	and is filed under food, pet please and tagged with pet please. You can follow any responses to this entry through the RSS 2.0 feed. The first thing I made when I got my press was PB, honey and banana. Amazing how good it is. Oo, I forgot about peanut butter and banana (I haven’t had it with honey). So good when toasted! Maybe put a little nutella on there too. Have you checked out the 300Sandwiches.com blog? Some of her recipes sound pretty spectacular and the story behind the blog/sandwich creation is also sweet. That blog should become the next Julie & Julia movie–it looks awesome! I subscribed. I wish I had made that sandwich! It looks amazing.